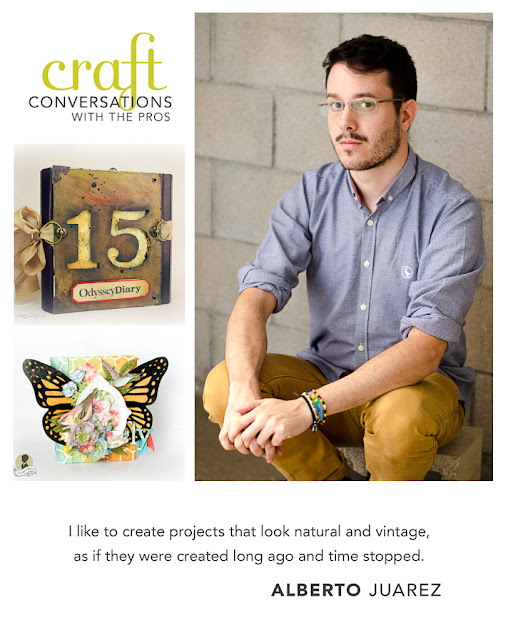 Paula Pascual: Craft Conversations with the Pros: Alberto Juarez from Vintage Odyssey! Craft Conversations with the Pros: Alberto Juarez from Vintage Odyssey! Este post esta también en castellano aquí. 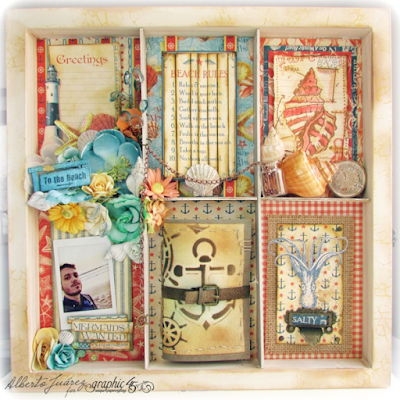 Today's turn for the Craft Conversations Alberto Juarez from Vintage Odyssey, who is a Spanish scrapbook super star, a real talent, Graphic45 ambassador and Prima Marketing Educator. I still remember when I came across his blog, I fell in love immediately with his work. He is also a delight and funny guy with whom you can spend hours and hours without a dull moment. So lets get to know him a bit better. Alberto, when and how did you start in the craft industry? 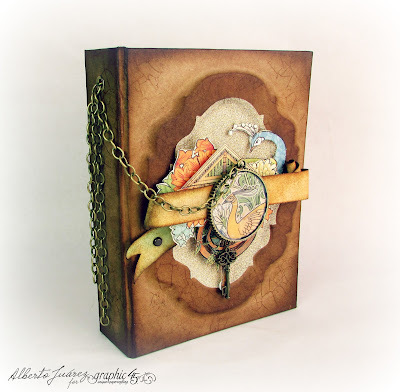 I discovered scrapbooking 7 years ago, before that I had done book binding and cartonage. I didn't know the scrap world existed until a day that I was looking for paper for my bookbinding projects (a diary to be precise!) and found a scrap shop. 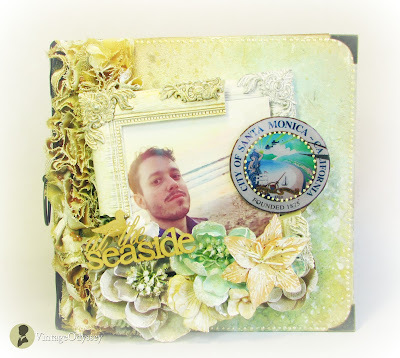 I went there and I discovered the wonderful world of scrapbooking. As a professional I started in 2011, when I began to collaborate with Graphic45 as a designer and I also started to teach workshops in Valencia and Barcelona. I have never worked in the scrap industry as my full time only job. I have always thought of it as a second job and as a hobby, though lately I think I dedicate more hours a day than any other job I do. Alberto is doing his PHD in Chemistry a the Valencia University. I started doing my blog, just an inspiration blog and as a brand ambassador. Soon after, I decided that giving workshops was a good idea to share my style and vision, so I started to teach online and then workshops in shops and events. 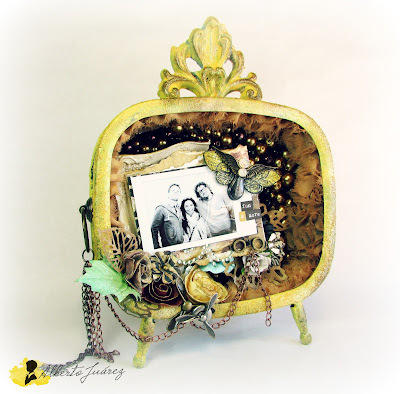 My projects are vintage, not only because of the style and material that I use but also because of the project type and techniques used. 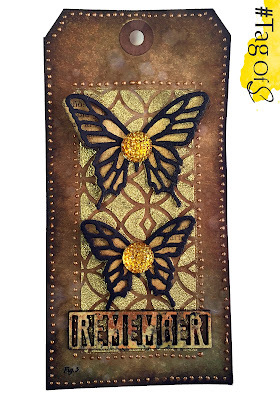 I always try to make long lasting projects, that will be strong and resist wear and tear. With that Victorian and classic flair that reminds us of the old pieces of craft, but as if time has stopped, no decay has taken place and they have remained in perfect conditions until today. I don't think I would do anything different, I have done it slowly and without any grand ambitions. I knew that I wanted above all to enjoy what I was doing and while I have made some common mistakes that everyone could make, I also have done many right things. Because of that, I would do everything exactly the same as, on balance, everything is very very positive. I would like to loose the fear I have got to the empty space as I have a very pronounced Horror Vacui. I would like to try pieces of artwork that are more and more Vintage Clean&Simple, trying to not be afraid of white and more brighter colours. 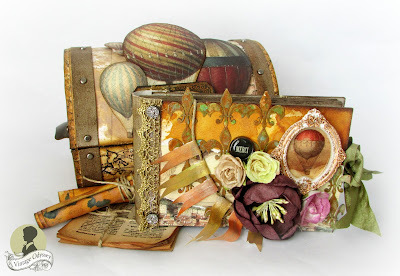 Before I started teaching workshops, what I liked the best was to create projects and work as part of a Design Team. Since I started to teach paper craft classes I I think of them 24/7! I always thinking about the projects and ideas for workshops, how to make them more attractive every time with new things so that people that come to them end up with a very beautiful project and that they really learn the concepts. Graphic45 ambassador and Prima Marketing Educator but do not belong to any Design Team. It is difficult to work in the craft industry if you are very focused in just one way. To be able to work and make a living of it you need to go further than just teaching workshops, you have to diversify and find new ways to expand your imagination. This question is already answered I think by Picasso: the inspiration happens when you are working. You have to work a lot, but it is clear that you have to have talent. I just don't believe in luck. 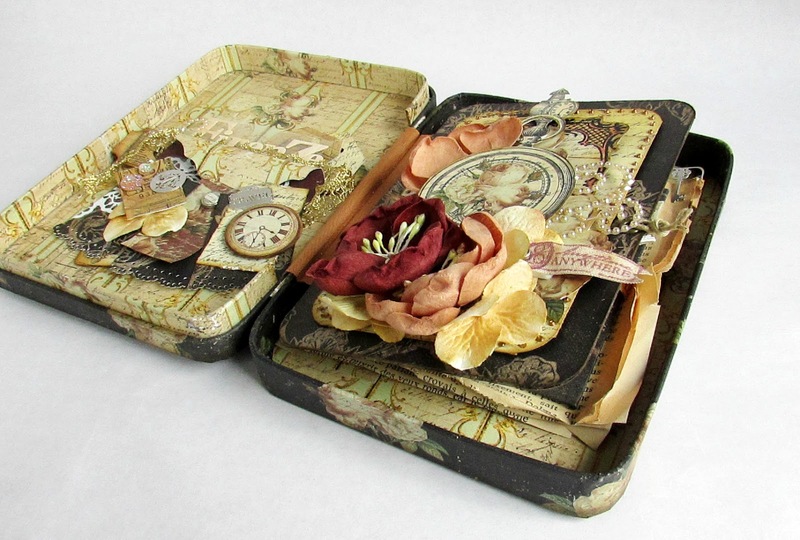 My favourite projects are always the mini albums and even more so if they are accompanied with a box to keep them in. I usually work with a palette of browns though I like to add touches of yellow, red and blue, but always within a range of darker shades and metallics. My aim is to create projects that look natural, that they are not artificial so the colours I choose reflect that. I love certain colours, but I avoid them in my projects because they would look artificial. For me there are two things that really inspire me. One, its antique shops, specially open air flea markets. Second, of course, an old book store is always a good place to find inspiration. And always accompanied of music! Right now I have plenty of projects in making, some of which I cant talk for obvious reasons! But one of the things I want to go back to is teaching and inspire through online methods. And finally, Do you remember when we first met? The first time we met face to face was in Creativa Madrid October 2014, though before then we already had talked online and emailed. I had already been told that you were a simply enchanting person. Exactly as Alberto says we met a craft show in Madrid. I was already a big fan, but even more so after meeting him in real life. We did a mini photo shoot between workshops, he is not only very cute but also very photogenic! A true joy to be with.